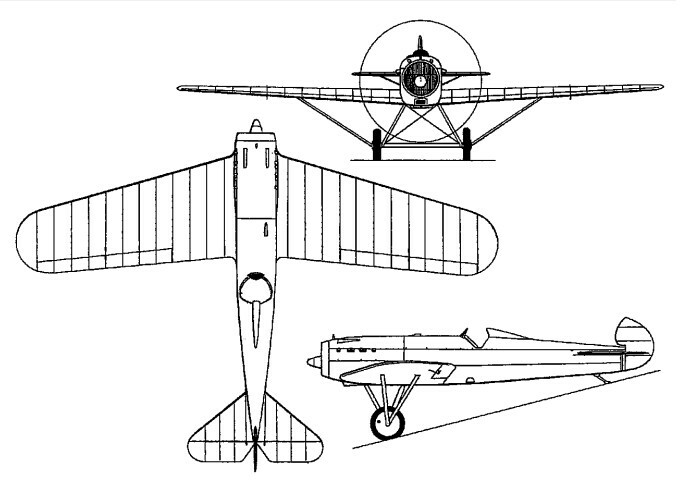 A semi-cantilever low-wing single-seat fighter monoplane originally intended for the 400hp Bristol Jupiter radial, the D XIV flew for the first time on 28 March 1925 with a 345hp Hispano-Suiza 8Fb eight-cylinder water-cooled engine. The wooden wing was braced by lift struts to the ends of the rigid undercarriage axle, and featured commencing immediately aft of the frontal radiator. Before the initial flight trials, a 590hp HS 12Hb 12-cylinder engine was installed. At the same time, the rear fuselage was lengthened for C of G reasons and a smaller rudder fitted (the fighter had no fixed vertical surfaces). Armament consisted of two synchronised 7.92mm machine guns and the detachable engine mounting was designed so that various alternative power plants could be fitted. The D XIV proved both fast and manoeuvrable, and test pilots of the German Reichswehr who evaluated the prototype commented favourably on its performance and stability as a gun platform. The prototype spun in, killing its pilot, and further development was discontinued.